The Votadini name has an Indo-European origin in the word for 'stand'. It descended through Early Celtic *wo-tādo to become the British 'wotād-' (which was used as part of an ethnic name). The root sense is 'foundation, support'. However, in the ethnic name in which it survived in Northern Britain, Votādini emerged as the masculine 'wotǭd', to which was added the Celtic/Germanic suffix '-on'. This was altered to '-in' and added to it was the Latin suffix '-i'. The consensus of opinion is that this was the name of an ancestral figure (especially according to the Scottish Place-Name Society's online Brittonic Language in the Old North database). Someone was named 'votad' or 'wotǭd', meaning 'foundation' or 'support'. It sounds like a nickname for a king in the same way that later kings were nicknamed 'hen' ('the old') or 'hir' ('tall'). His followers retained the name and it stuck - the Votadin (or Votadini to the Romans and 'wotadin' to modern English ears). An alternative view is that it is a locator description meaning something along the lines of 'people of the broad place', used to describe the low-lying nature of the Lothian and Borders territory. The modern city of Edinburgh is at the heart of the region of Lothian, which itself is an ancient name. This may have formed the centre of Votadini territory, and if not early on then seemingly by the fourth century. The massive volcanic hill fort of Traprain Law (Haddington in Lothian, with a hill fort on top of it that was called Dunpelder) probably supplied the tribal capital (or perhaps a religious centre) until it was abandoned in the fifth century. However, the word 'law' comes from the Norse 'hlaw', so this part of the name was a later addition or replacement - the Votadini would not have used it. A promontory fort at Dunbar was also occupied in the first centuries BC and AD, as proven by archaeological finds, and another hill fort site could be found at Eildon Hill near Melrose. The nearby Firth of Forth was called Bodotria by the Romans. This was rather obviously linked to the name of the tribe that occupied its southern shore - the Votadini. The 'b' could indicate the probability that, at the time at which the Romans first entered the area, the Votodini name was pronounced with an initial 'v' sound instead of a 'w' sound. 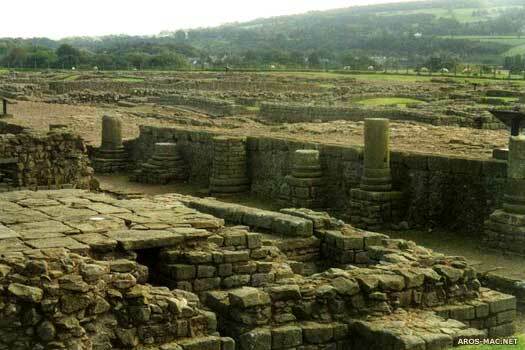 Also in the north, Roman Vinnovium became Binchester, another 'v'-to-'b' mutation (the surviving 'vinn' becoming 'bin', with the Anglo-Saxon 'chester' (Latin 'castrum') added on). It is rather harder to go from a 'w' to a 'b', but quite easy to slide from a 'v' to a 'b'. This region, between Hadrian's and the Antonine Walls, was under direct Roman military rule between AD 138-162. After that it was organised as a buffer state, reaping many of the rewards of alliance with Rome but not under its rule - undoubtedly one of the 'four kingdoms' which formed between the two Roman Walls. The hill fort of Traprain Law (Haddington in Lothian) is first placed in use by the local inhabitants (long before they exist as the Votadini). At this stage it is only a burial place, but within half a millennium it becomes occupied on a permanent basis, with ramparts and a defined hill fort defensive structure. A hill fort at Eildon Hill, close to Melrose in the Scottish Borders, is first occupied around this time. Its ramparts are built and then rebuilt in three distinct phases, although it may not remain important after the fourth century AD. After 400 BC the chieftains here live confidently, with unimpressive ramparts that have no less than five entrances and perimeters of over one-point-five kilometres (a mile). The impression given is of a holy place rather than a fort, with the boundary providing a sense of separation from the outside world. That isn't to say that a Votadini king with a priestly role does not live here, with his accompanying elite group. They would be joined by the people on specific festival or holy dates. This is also the period in which the Iron Age begins to arrive in Britain, introduced alongside more early Celtic settlers. The site of Caerau in the later territory of the Silures shows evidence of this, although the initial spread of the Celtic newcomers is probably confined to the south and south-east coast before it moves inland. It is quite possible that with most of southern Britain eventually held by Celts, the largely pre-Indo-European natives of the west and north respond to the threat by building defences that contain the latest technological advances, which are typical of those seen at Caerau. The use of iron weapons would more quickly supplant the bronze ones as a matter of necessity, and pockets of pre-Indo-Europeans would survive and persist much as later Romano-Britons do in the face of Anglo-Saxon advances, with the natives adopting elements of the newcomers' weapons and fighting techniques as a matter of survival (the Votadini could be an example of this). Either way, Celtic language and tough iron swords gradually replace native language and soft bronze swords across the country over the course of the next 250 years. The only known chariot burial in Britain outside the territory of the Parisi takes place during this century. The location is a Bronze Age burial cairn which is surrounded by three standing stones, at Huly Hill near Newbridge (fourteen kilometres to the west of Edinburgh), and the date places it at least a century earlier than its East Yorkshire counterpart. However, in this case the chariot is buried intact, a style of burial that much more closely echoes the Continental La Tène types, and La Tène material is found by archaeologists at various sites across Votadini territory. The Roman Governor of Britain leads two invading columns into Lowland Scotland, with (probably) the Twentieth and Ninth Legions meeting up at Inveresk (near Edinburgh, the territory of the Votadini). The force sets up permanent garrisons in its wake. The following year the campaign continues into the territory of the Selgovae and Novantae tribes, and in AD 82 the Damnonii are contained along the western coast. The northern Brigantes apparently revolt, perhaps under the leadership of Argiragus, a possible candidate for high king (as is any British chieftain who refuses to surrender to the Romans). Argiragus seems to be responsible for the burning of the auxiliary fort at Corstopitum, as well as others, as the British tribes of lowland Scotland stage a major uprising. By AD 100 the Romans give up the north, and fully establish their defences along the Tyne-Solway line. The Romans move north to the Forth-Clyde line, roughly the southern Caledonian boundary, reoccupying Lowland Scotland and beginning construction of the more basic Antonine Wall (curiously, this takes place immediately after another revolt by the Brigantes is put down). Coins announcing a victory are issued in late 142 or early 143 to mark the event. Tribes like the Votadini come under direct Roman rule and forts are built (if they had not already been built during the initial period of occupation from AD 80). One such fort is at Trimontium (Newstead), which receives some rebuilding in AD 90. It is located perhaps a kilometre or so from the foot of Traprain Law which itself remains occupied throughout the Roman period. This may be explained by the latter being a religious centre rather than a military one, with the Roman commander quite happy to see a focal point for tax collection that is nearby. Although this phase of occupation is not nearly so well recorded as is the invasion of southern and eastern Britain a century before, one can imagine a similar policy being pursued of allowing kings to remain in place for those tribes who cooperate, and then refusing to allow their successors to assume power. Fortunately for the Votadini, the period of occupation is short and the tribe subsequently remains on friendly terms as an official buffer state. In response to a growing need for troops elsewhere, the Romans seem to abandon the northern, Antonine Wall around AD 162-163, although some outpost forts may remain in use until at least the 180s. A fort excavated at Camelon, just two kilometres or so east of Falkirk, seems to confirm a withdrawal date of this time. 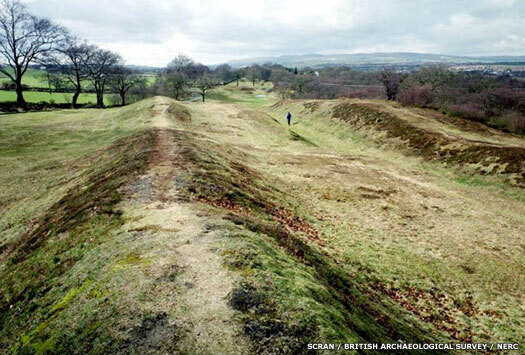 Hadrian's Wall itself is certainly still garrisoned, as archaeology has proven. One probable reason for the Roman withdrawal to beyond Hadrian's Wall has been Corvus of the Damnonii. He apparently announces the creation of a kingdom in AD 148, and raises a following of British patriots. In AD 184 he dies fighting the Romans but his kingdom remains outside direct imperial control, one of four such kingdoms. The others are probably those of the Votadini and Selgovae Britons, and the Novantae Caledonians. Britannia's two provinces are subdivided into four by Roman reorganisations. 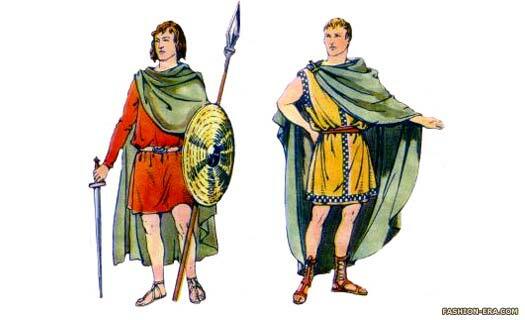 These are named (by no later than 314) as Britannia Prima (with a capital at Glevum in former Dobunni territory), Britannia Secunda, Maxima Caesariensis, and Flavia Caesariensis. The new provinces form part of the Diocese of the Britains. At the same time, Constantius personally leads a campaign into Caledonia to bring the elusive tribes in the Highlands to battle and ensure a period of renewed peace. The Romanised Paternus Pasrut is, according to tradition, a fairly high ranking Romano-British official or a frontier chieftain of the Venicones who is placed in command of Votadini troops in the Clackmannanshire region of Caledonia, north of the Firth of Forth. Perhaps this placement of Votadini troops forms the grounds for the later establishment of Votadini overlordship of the Manau Gododdin (the territory of the Venicones) following the removal of Roman authority. Interestingly, the Goddodin poem has a place name of Gwanannon on the border of Guotodin (see Kilpatrick's work in the references above). There is the possibility that the 'gw-' at the beginning of this name was in fact a 'w-' which had shifted thanks to language changes from an original 'm-'. This would give Manannon as the original name - a very good option for the origin of Clackmannan. The relationship between the Votadini and the Venicones is an intriguing one. The Votadini are clearly foederati by the time the Romans invade Fife to crush the Pictish navy (the seagoing Venicones). The next mention of Venicones is for AD 305, with them seemingly in charge (at least of a unit of Votadini troops). But then the situation swaps around, with the Venicones soon under Guotodin rule. How this happens is unknown but intermarriage is the probable answer. Are the Venicones under Guotodin rule when Cunedda is sent south to attack the Irish in Gwynedd? Or do the Guotodin assume (or inherit) overlordship after Cunedda's departure? The fact of overlordship implies that the Guotodin are involved in the early Roman invasion of Fife, perhaps supplying cavalry support. The eponymous founder of Din Eidyn who is otherwise unknown. With the fading of Roman central administration in Britain, it seems that regional Governors, or dux, are set up to manage the protection of the island. The province of Britannia Secunda in the north is placed under the authority of dux Brittanorum, Coel Hen at Ebrauc. It is possibly this arrangement which finally cuts the links between the southern Votadini and those to the north of Hadrian's Wall. The southern region re-emerges as part of the kingdom of Bernaccia in the early fifth century whilst the northern section forms its own tribal kingdom named the Guotodin. The modern city of Edinburgh is at the heart of the Lothian region, which itself is an ancient name. Traditionally, Lot was the first independent, post-Roman king of the region that bears his name, ruler of the Romano-British tribe of the Votadini. By this time pronunciation of the name had altered to Guotodin, which is sometimes shown by modern writers as Goutodin, with the 'o' and 'u' incorrectly swapped around. The still semi-tribal, hero-led Guotodin kingdom was probably created out of Coel Hen's 'Kingdom of Northern Britain'. No names are put forward as Guotodin kings by tradition or early writings until after his powerful governance had ended. It appears to have been his death that began the gradual division of the Roman militarised north, and it was also around this time - the fourth century - that the southern section of Votadini territory seemingly became independent of the northern section as Bernaccia. The northern Votadini territory probably had a border at Berwick, a scene of later conflict with the later Bernician Angles, but the kingdom eventually fragmented under pressure from those Angles after half a century of resistance. It is possible that the territory was initially part of Alt Clut, as some sources show its powerful first king, Coroticus, ruling here as well as further west (possibly as a high king with a local sub-king who acknowledged his supremacy). The capital, or main fortress, seems to have been at Din Eidyn (with at least partial occupation that can be dated as early as 850 BC, thanks to Bronze Age material being left behind). This may have survived the fall of the Guotodin for a short time, in the form of an enclave in the early seventh century. It was later called Edinburgh by the Angles, the name being unchanged apart from the switch from the Brythonic to Germanic form of the word for 'fort' (although the older version still survives in Scots Gaelic as Dùn Éideann). It has been stated that the capital was a creation of the Angles, with King Edwin of the Northumbrians claiming the naming rights. This is clearly incorrect as the name was in use for the fort prior to its capture (see the Annals of Ulster). As with many British names, the Votadini tribal name became somewhat altered in the period between the tribe's first recording by the Romans in the first century AD and its emergence as an independent kingdom in the late fifth century. The exact shift is uncertain, but it probably did something like this: British 'votādin' (with a 'v' sound) to 'wotodin' (with a 'w' sound), and then to 'gwotodin' or 'guotodin' (with a 'gw' sound) - modern Welsh spells this sound 'gw', and Brezh (Breton) spells it 'gu'. The Old Welsh 'guotodin' was the version in use in the fifth to seventh centuries, which later became 'gododd-' (Middle and Modern Welsh, the plural being 'gododdin'). As mentioned above, the older form of the name is often used but with the 'u' and 'o' swapped around to produce Goutodin. That same 'w-' to 'gw-' transition can be seen in the name analysis for Clackmannan (see AD 305, above) - possibly the Gododdin's Gwanannon. The kingdom could also call upon Traprain Law (Haddington in Lothian) to act as a substitute capital, which perhaps pre-dated Din Eidyn. However, this hill fort was abandoned in the fifth century. Also of note was the area of Manau (Manaw). The Manau Gododdin (note that the second part of the name is in its late Welsh form) were a subsidiary of the main Guotodin people. They occupied land just beyond the Antonine Wall, around the Forth's headwaters, which provided natural citadel at Stirling. They had probably formed part of the Venicones tribe in the first and second centuries, but it was from here that Cunedda Wledig, almost legendary founder of Gwynedd, migrated. Bede mentions Stirling as urbs Guidi, and this was adapted to provide the Firth of Forth with its early Welsh name of merin Iodeo, 'the sea of Iudeu'. Cunedda Wledig (the latter word is the later Welsh for 'prince') and his branch of Romanised Venicones are transferred from the Manau dependency of the Guotodin kingdom, traditionally under the authority of Magnus Maximus, although perhaps this is handled by Coel Hen of 'Northern Britain'. They are moved to the former territory of the Deceangli in western Wales to secure the region from Irish raiders, and it is here that they found the kingdoms of Gwynedd and Ceredigion. The Guotodin appear to become fully independent around this time. Independent of precisely whom is unclear, but the two main holders of regional authority are Ceretic Guletic of Alt Clut (and his grandson, Dumnagual Hen), and Coel Hen in Ebrauc. The old ways are probably returning faster in the north than in the south, in regions more often governed by generals than magistrates (the latter often emerging as regional rulers in the south). Despite this drift away from centralised rule, the nascent kingdoms are probably still under the authority of men who are more Roman general than Celtic king. They are most likely regimented and authoritarian, and the ruler of Ebrauc, capital of the north, is probably recognised as being the first among equals. The Wall is still guarded, although it is rarely needed as a boundary marker, given that the people of Alt Clut and Guotodin on the other side are now reliable allies. The Votadini hill fort of Traprain Law (Haddington in Lothian) is abandoned in this century, seemingly replaced by Din Eidyn as the capital. 'King of Gododdin' in later tradition. First independent king? King Lot of the Host should not be confused with Llew ap Cynfarch, king of Caer-Guendoleu (573). Even so he is known (appropriately) by a host of variations of his name, including Lewdwn, Luddoc, Leudonus, and Lot Luwddoc, perhaps confirming his popularity as the leader of a great host (a large and powerful war band). He is able to trace his (fairly obscure) lineage back to High King Caradog, king of the Catuvellauni, and he rules the Guotodin from Traprain Law, the traditional capital, while the later region of Lothian continues to bear his name. Son (the Gawain of the Green Knight story). 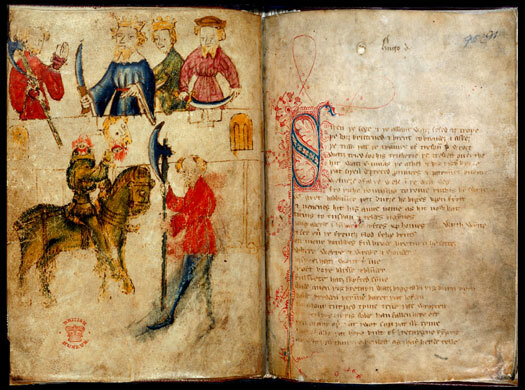 Gawain appears to rule Guotodin from a distance, being found first in Rheged and then in Wales (although his appearance in the latter region may only be attributed to him by the bards who bring the stories of the Men of the North with them to Mervyn Frach's new court at Gwynedd in 825). He is also the hero of the medieval tale Sir Gawain and the Green Knight. His apparent absence either allows Bran Hen of Bernaccia to take control, or he hands the care of the kingdom to Bran. Morgan Bulc accedes to the kingship of Bernaccia, apparently at young age, when his childless uncle, Bran Hen, dies (or perhaps hands the kingdom to him from his own apparent base in Guotodin). To the south, the British kingdom of Bernaccia is seized by the Angles who have been serving as laeti and the ruling king, Morgan Bulc is forced out. He takes refuge with the Guotodin, shifting his power base to the immediate north of his own former kingdom, and becomes its ruler after Gawain absents the kingdom and Bran Hen dies. Last British king of Bernaccia. Mentioned in 579 & 586. Son. Possibly confused with Cynan. Elmet and Rheged form a confederation of British kings, primarily based and operating in the North. Morcant Bulc and Rhiderch Hael of Alt Clut both join the confederation in operations against the Angles, and are present at the siege of Ynys Metcaut (Lindisfarne) in this year. The Bernicians are almost driven out of Britain but the confederation falls apart when Morcant has Urien Rheged assassinated, fearing his great power should the Britons win the war against the invaders. His act fatally weakens the British cause in the North. The defeat and the disappearance of Morcant removes him entirely from history (he is not mentioned again, even as a ruler of Guotodin, so it is possible that he is killed either by Rheged, or by the Bernicians, or even by his own war band). The final two British kings of the Guotodin appear to rule simultaneously, Cynan claiming Lothian and Mynyddog claiming Din Eidyn. As the latter may be the capital of Lothian, could Mynyddog, with all his wealth, be the overlord of the entire region, or has it been divided equally between the two men, perhaps east and west Lothian? The latter would certainly be in line with traditional behaviour. King of Lothian. Fought Bernician Angles at Catreath. King of Din Eidyn. Fought Bernician Angles at Catreath. Mynyddog is this king's given name, while Mwynfawr can be ignored as a nickname or 'fame' name. Mynyddog breaks down into 'myny' and 'ddog'. The former appears to be the Old Welsh 'minn' and 'mynn-' meaning 'to want or claim'; and 'ddog' is the deity name that is unrecorded in Britain but which is known as Dagda from the Irish. The combination probably means 'claimed by Ddog (Dagda)'. The deity name itself simply means 'good', which could have led to quite a bit of tongue-in-cheek humour - Dag, Ddag, and Dog being cross-punned as the Welsh word for good, 'da'. For example, this makes Cunedda of Gwynedd both 'good hound' and 'hound of (the good) deity, Ddog'. Welsh form of Arthur, one of many 6th century princes named so. Y Gododdin is a long series of elegies composed in Old Welsh from the early seventh century onwards, principally by Aneirin, son of Dunaut of Dunoting. It commemorates a force of Britons who assemble near Din Eidyn at this time in preparation for facing their powerful foe. It includes not only the still-wealthy and aggressively strong Guotodin themselves, but warriors from all over the country, including 'three chiefs of Novant', clearly the nearby Novantae in post-Roman form (and also an unknown number of peasant militia who are not worthy of mention in a grand poem). After attending 'churches for shriving, true is the tale, death confronted them' - clearly the British Church exists here - this force marches south to fight the Angles at Catreath (generally accepted as being modern Catterick, approximately eighty kilometres north of Ebrauc). It seems strange that they should march past Bamburgh on their way, the capital of the early Bernician kingdom, but perhaps not if they are making an attempt to reclaim the lost capital of the North, Ebrauc. The battle seems to take place during an attack against the Roman fort near the strategic road junction now called Scotch Corner, by the south bank of the Swale at Catterick Bridge. Gwawrddur is praised for 'glutting black ravens on the wall of the fort, though he was not Arthur' (a term used to denote great slaughter of the enemy, but even so this warrior is still not a match for Britain's heroic battle leader of the previous century). Ultimately, the battle is a disaster for the Britons. The flower of the Northern British warrior class is decimated by the superior numbers of the Bernicians or Deirans. Guotodin, as well as the other kingdoms of the north, probably including Elmet, are all fatally weakened by the defeat. Unknown survivor of Catreath who rules the (truncated?) kingdom. The events of around 597, as chronicled in the Gododdin, sound the death knell for the kingdom. Unable to recover from this, the Annals of Ulster note pithily 'the battle of Glenn Muiresan and the besieging of Eten' - Din Eidyn. No more is mentioned, not even the outcome of the battle. The monks on Iona record that the attacker is Domnal Brecc of Dál Riata, and defeat for the Britons is clearly implied as the battle leads to the siege. Din Eidyn apparently falls to Oswald of Bernicia (soon afterwards, it seems), and notably the Irish annals use a variant of its name - Eten - to help the case against 'Din Eidyn' being an invention of the Angles. Possibly the siege ends in a surrender rather than a storming of the fort. If the site of Din Eidyn is Castle Rock in modern Edinburgh then a successful siege and storm would have been a formidable feat indeed. 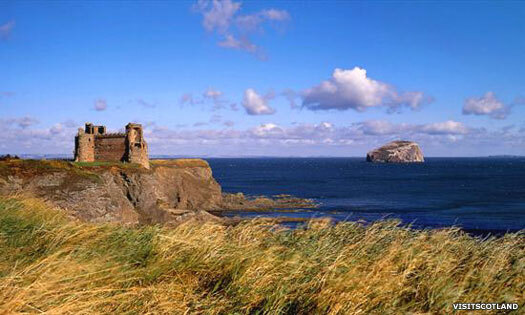 Either way, the Northumbrians rule the territory directly until 671, when a sub-kingdom named Dunbar is formed. Oswald's death in 642 possibly sparks a contest between the northern powers for control of the Firth of Forth and the Guotodin lands. 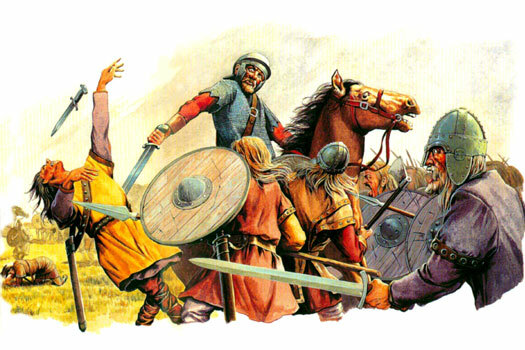 Owain of Alt Clut and Domnal Brec of Dál Riata fight at Strathcarron, to the east of Din Eidyn, and the Annals of Ulster mention a battle between Oswald's successor and a band of unnamed Britons - possibly Alt Clut again (or even the remnants of the Guotodin themselves). Clearly, thanks to Northumbria's retention of Dunbar in the seventh century, the Angles hold on to their newly gained territory. This town in East Lothian is located forty-five kilometres (twenty-eight miles) to the east of Edinburgh. It was at the centre of a short-lived Northumbrian sub-kingdom that encompassed some of the territories of the former Lothian kingdom, and was formed at some point after the reign of Oswiu. The location had been a fort that had been occupied since at least the first century BC, and seemingly remained so throughout subsequent centuries. Archaeology has shown that a large, sunken-floored building existed in this period, surrounded by two concentric post trenches - defensive timber walls. In Votadini Brythonic, the name Dunbar translates roughly as the 'fort on the height'. The modern Castle Park in Dunbar preserves the footprint of the earlier Iron Age promontory fort that would have been used at this time. The name may have entered Scots Gaelic as 'Dun Baer', or Dunbar could have been the English adaptation of that name. It is more likely, however, that the original name was Brythonic in origin, in the form of 'din bar', and the other two languages adopted and adapted that version. The creation of Dunbar as a regional capital was probably part of the Northumbrian effort to conquer and colonise southern Pictland, much of which they held for thirty years from about 655. This was the date at which, having defeated Penda of Mercia and Aethelhere of the East Engle, and having conquered Mercia, Oswiu was acknowledged as Bretwalda. He was able to forge a single kingdom of the Angles north of the Humber, known, as with many Anglo-Saxon kingdoms, by its geographical location - Northumbria. The attempt to conquer the Picts eventually came to nothing, probably weakened by the deaths of its successive rulers at the hands of the Picts themselves. However, Guotodin independence seems largely to have been restored in the region around Edinburgh, although very little is known of it. It probably had to carry out a balancing act of pleasing the Picts on one hand and the Northumbrians on the other, and would have been in danger of being caught in the crossfire whenever those two went to war. In time Northumbrian dominance was reasserted in Edinburgh, ending any possible thoughts of a restored Guotodin kingdom. Sub-king. Killed at Nechtansmere by Brude of Pictland? Drust (or Drest) of North Pictland tries to expel the Northumbrian invaders from his land, but is defeated by Ecgfrith and removed from the throne. Whether these invaders have enjoyed supremacy over the kingdom or not is unclear, although the accession in 653 of Talorcan son of Eanfrith would suggest this. The Northumbrians are also dominant in the Lothian region, and a sub-king has already been appointed to Dunbar, possibly a relative of the king. He rules the Picts in Ecgfrith's name. Attempting to consolidate thirty years of occupation in southern Pictland, Ecgfrith of Northumbria leads a huge army against the Picts at the Battle of Nechtansmere, probably including forces from Dunbar amongst his army. The Picts defeat them and massacre the entire army including Ecgfrith, and proceed to clear Pictland of the remaining Northumbrians who have settled there, killing or enslaving them. The men of Dunbar (the former Guotodin) sack the Northumbrian monastery at Abercorn to the west of Edinburgh and, according to Bede, regain their freedom. The former kingdom does not re-emerge, but Dunbar itself seems now to operate with at least some degree of independence, although with an eye towards Northumbrian preferences in its politics. Its name is recorded as Dynbaer in the Vita Sancti Wilfredi (The Life of St Wilfred, bishop of Ripon, died in 709 or 710), which is written in the next century. Son and sub-king (dux regius). Killed by Brude of Pictland? Son? Sub-king. Killed at Manaw by the Picts? Nechtan of the Picts tries to befriend the Northumbrians. They send a war party under the leadership of Beorhtfrith, King Osred's chief ealdorman and a battle is fought on the Moor of Mannand (Manaw, near the Firth of Forth). The battle results in heavy losses on both sides, and no recorded victory. The semi-independence of Dunbar may survive past this date, but at some point, either now or later, it is subsumed within Northumbria to be ruled directly. Surprisingly this reintegration happens at a time in which Northumbria is beginning a long, slow period of decline, possibly under the reign of the dissolute Osred I or Coenred, his successor. An army from the Viking kingdom of Dublin under Ivarr the Boneless gains control of the kingdom of Northumbria (as loosely shown in the 1958 feature film, The Vikings). Osbert and Ælla lead an army into the Roman ruins of York to fight off the invaders in a bloody and protracted battle. The English do great slaughter but following the deaths of their kings and their bodyguards, the survivors come to terms. English ealdormen continue to rule Bernicia under the Viking aegis while the Vikings directly control Deira. Eadred of Wessex becomes the first recognised king of England when the Scandinavian kingdom of York falls to him. He hands the day-to-day governance of the region to Oswulf, high reeve of Bamburgh. These reeves may also rule the area north of the Tees (former Bernicia) almost as an independent kingdom between 878-927, being referred to, or referring to themselves as sub-kings. The Annals of Ulster called the first of them the 'king of the North Saxons'. The Guotodin territories become part of the Scottish crown. Dunbar (Lothian) re-emerges as an earldom of Scotland in the eleventh century, to be granted to Gospatric, deposed earl of Northumbria in 1072.